In 1974 Gonzaga University, a small, financially struggling school, was in need of a new president. Enrollment and endowment funds were down; and the school was in debt. For the first time in the university’s recent history, an ‘outsider’ was considered to assume the presidency. Fr. 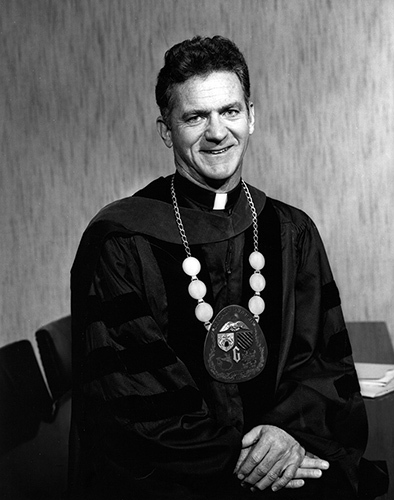 Bernard J. Coughlin, S.J., previously the Dean of the School of Social Service at Saint Louis University, accepted the position during this time of instability. During his 22 years serving as president, the university saw unprecedented growth in terms of finances, campus size, student enrollment, and academic reputation. Even considering these impressive achievements, Coughlin was much more than just a university president. This exhibit shows the multi-dimensional life of one of Gonzaga’s most devoted administrator and illustrates how his role as a priest, scholar, civic leader, and friend to the community influenced his success as president. Fr. Coughlin currently resides at the Jesuit residence in Los Gatos, CA. The materials were drawn from Gonzaga University Archives and the Northwest Jesuit Archives. Exhibit guest curated by History intern Olivia Lada, Class of 2019.